Patrick Runte's photographs don't just imagine what old video games might look like in the real world — with blocky characters translated into three dimensions. They also imagine how those games might be played in our world — and they look like a good deal of fun. 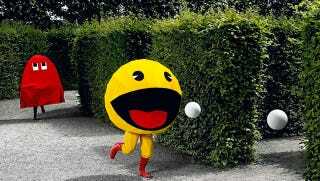 Hedge maze Pac-Man would be a blast, and not being able to see the placement of all the dots and ghosts adds a layer of difficulty to the game. How would you go about doing real-world Tetris, though? Would you have a wind machine or conveyer belt that pushed players down in one direction?